PHOENIX – With President Barack Obama proposing free community college in his State of the Union and proposed budget, a state lawmaker says Arizona should start laying the groundwork now. Rep. Reginald Bolding, D-Phoenix, authored a bill that would provide two years of free community college tuition to state residents who maintain a grade-point average of 2.5 on a 4.0 scale. The provisions would only apply if the federal government covers 75 percent of the cost. The state would be responsible for the remaining 25 percent. His bill, HB 2487, had yet to be assigned to a committee. The White House touts Obama’s plan as benefiting up to 9 million students nationally and saving each up to $3,800 in tuition a year. “We’re looking at a whole new group of individuals who are now inspired to continue their education,” Bolding said. A year’s worth of full-time tuition at Mesa Community College is $2,016, while the annual cost of full-time tuition at Mohave Community College is $1,920. 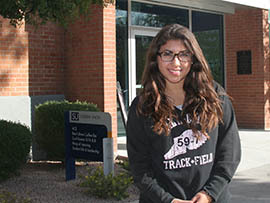 On a recent weekday at Phoenix College, student Yanneth Arizpe said free tuition for two years would be “something less to worry about.” She works 40 hour a week to pay the bills, including a monthly payment plan for her tuition. “It would be really great, honestly,” she said. Arizpe said she plans to eventually study mechanical engineering at Arizona State University but chose to start at Phoenix College to save money while taking general classes. “It makes it a little bit more affordable, but it’s still pretty expensive,” she said. Zach Cassaro, a senior at Queen Creek High School, said he expects to have to work part-time to attend Mesa Community College in the fall. His biggest fear about higher education: paying for it. “Not having your parents help you and having to make all your own money for your own college is pretty tough when you have to work a minimum wage job,” he said. Pearl Chang Esau, president and chief executive officer of Expect More Arizona, said parents and students often raise concerns about tuition and financial aid when her education-advocacy group makes presentations in schools. “Tuition is a key barrier,” she said. While not offering an opinion on free community college tuition, Esau said she likes that Obama’s plan focuses on the importance of higher education. “High school can no longer be the finish line for any child,” she said. Jonathan Butcher, education director for the Goldwater Institute, an independent group that advocates for limited government, said the price tag for offering free tuition is cause for concern with the state budget facing a deficit. “Something like this would be a challenge for state taxpayers,” he said. Butcher said the Legislature’s focus should be on the K-12 education needed to prepare students for higher education. But Bolding said Arizona’s economy would benefit from expanding access to higher education. “Recognizing the challenges that kids have in particular communities, and specifically those communities that are low-income, inspired me to run the bill,” he said. 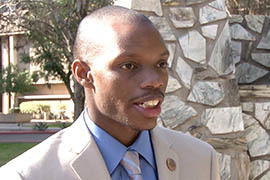 Rep. Reginald Bolding, D-Phoenix, wants Arizona to lay the groundwork for President Barack Obama’s plan to offer two years of free community college tuition. Phoenix College student Yanneth Arizpe said free tuition for two years would be "something less to worry about." Click on the map to see enrollment and tuition at some Arizona community colleges.